Gross Area: 196,000 sq. ft. 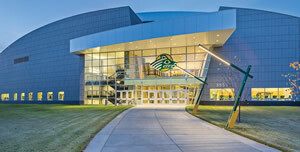 The University of Alaska Anchorage’s (UAA) Alaska Airlines Center (AAC) is designed to be a connector—creating a pathway from housing to campus, strengthening relationships between students, faculty, and athletics, and enhancing engagement within the Anchorage community. It houses all of the school’s athletic teams and staff. It is a place for student recreation, banquets, dances, and graduations. It serves a community need for a place to host concerts, recreation, sports, conferences, and large events. 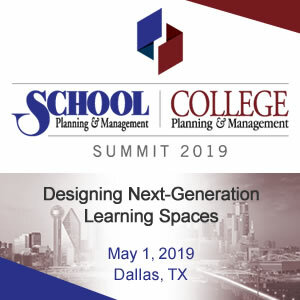 The model public/private partnership integrates campus planning with district-wide concerns. At the outset of the project, the following objectives were identified: support athletic programs, enhance campus life, create a signature facility, engage the community, and build sustainable infrastructure. The new arena is both bold and elegant in its form and development. Its focal point is a graceful arched roof that spans the arena and auxiliary athletic spaces. Supported by long-span bowstring trusses, the unique structure organizes the functional space and defines the facilities’ signature. The five level plan is organized around three large activity spaces, the arena, auxiliary gym, and gymnastics practice bisected by the main pedestrian concourse. Support spaces are clustered around courts and zoned by floor for specific activities. The basement level houses athletic support; entry/first level houses fitness and recreation; second level includes offices with balcony seating and suites; and the upper level includes a restaurant with stadium viewing and outdoor access to surrounding mountain views. Neighbors: medical centers, adjacent private university, business interests. UAA Athletics: administration, faculty, coaches, boosters. Community: event organizers, municipal planners, recreation enthusiasts. Participation was tailored to the stakeholder needs: on-line surveys for students, focus groups for coaches and athletes, community forums for the general public, and work sessions for institutional neighbors. Key representatives were assembled as a project advisory committee to collaborate regularly with the design team, shaping and refining the design to meet the broad range of objectives. UAA’s executive committee provided key oversight assuring alignment with strategic goals. Collaboration continued through construction using a Construction Manager at Risk delivery method to address an aggressive schedule and tight budget. This quote from Christopher Alexander’s, “A Pattern Language,” aptly describes a key to the success of the project. Early exploration of the site and context uncovered ruptures in the urban fabric, including: inadequate vehicular access to adjacent medical center, a series of dangerous intersections on a busy arterial, isolated pedestrian pathways that lacked security, and poor connection between student housing and the campus. 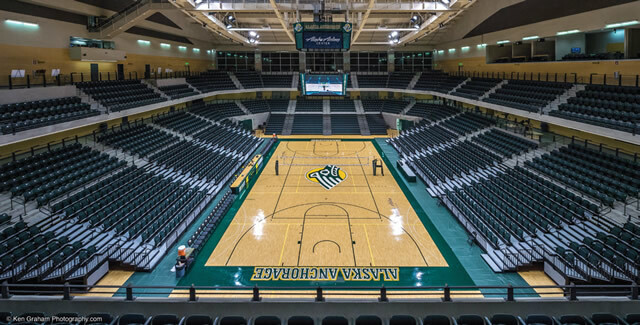 All of UAA’s athletic teams are now housed under one roof and many of the school’s competitive events are hosted in or around the facility. The multi-level activity zoning allows for natural control of athletic areas alongside public and recreational functions. 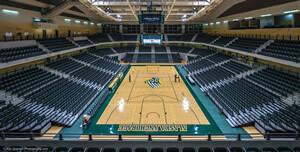 AAC is a hub of activity for UAA and community non-athletic events, informal gatherings, concerts, and recreation. The strategically developed pathway encourages interaction and stimulates engagement. Chugach Mountains. Transparent and inviting, it is a beacon in the long, cold Alaskan night. AAC is simply a fun place to be. The architecture is exciting and the spectator experience is intense. The flexibility of its configuration and superb acoustical/AV systems make it an ideal venue for a wide variety of non-UAA events. The main arena floor is recessed one level providing vistas from the concourse and a seamless flow from entry to seats. The three tiered seating bowl, highly unusual for a 5,000 seat venue, puts every seat close to the court and increases the intensity of the experience. It also allows the venue to be easily scaled by retracting seats and closing the balcony for smaller events. Sustainability workshops organized the project approach into practical strategies that reduced energy consumption and enhanced occupant productivity and enjoyment. Daylighting strategies combined with high efficient lighting reduce overall electrical loads. Cooling utilizes a combination of economizer cycles in winter months supplemented by well water cooling when temperatures rise utilizing a fraction of typical energy fossil fuel driven chillers. 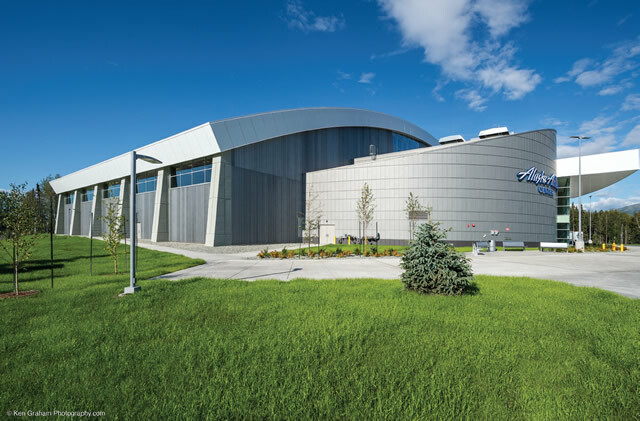 Exteriors feature natural metals, zinc and aluminum, that will age gracefully with minimal maintenance over the facility’s projected 100-year plus life span. Natural areas were preserved to facilitate 100 percent retainage of storm water runoff and snow storage. This project was a unique opportunity for UAA to create an iconic landmark that speaks to their mission—the State of Alaska and their mascot, the Seawolf. A carefully structured branding process identified key themes and developed opportunities for the story to grow and develop over time, including: a 60’ edge lit ‘Echo of the Sea-wolf ’ logo, dual-sided display cases with glimpses of the arena, bronze inlay championship plaques in the concourse floor, Seawolf-themed signage, sophisticated UAA color/texture scheme, and super-scaled banners celebrating each athletic team. 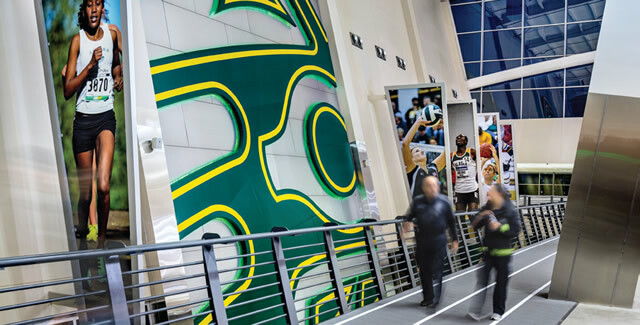 An important goal for UAA was to create a campus asset that also engaged the vast majority of students that are not involved in competitive sports. The facility was strategically placed to encourage students to pass through on their way to and from campus housing, creating an inviting pathway. The upper concourse is open so passersby experience the sounds of ongoing events encouraging them to linger and warm up. In order to become a reality, the project needed campus support in addition to municipality, local community, and state support. AAC forms the southeast campus gateway and is ideally located to serve as a community asset for hosting statewide events, corporate gatherings, public meetings, and a restaurant that overlooks the arena and has a south-facing porch for outdoor dining. The building is a key recruiting and retention tool that conveys the quality and excitement of the institution to visitors and future students, staff, and faculty. 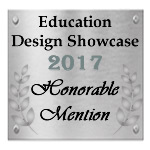 Incredibly comprehensive design, from site plan to interior graphics. A successful, inclusive planning process and effective public-private partnership. Quite a beautiful building.